When we opened our first factory and showroom in New York City in 1855 our business proposition was simple. Make the finest beds available. Remarkably, more than a century and half later, we're about a block from our original location, now known as America's “secret source” for superior beds and mattresses. Our range of styles includes the only independently tested and top-rated mattress for the last 4 consecutive years as well as wood, brass, iron and leather beds from original, century old classics to innovative contemporary designs, often seen on the pages of leading home decorating magazines. Charles P. Rogers beds are the first choice of leading decorators and designers, yet we also sell direct to the public at substantial savings from regular prices. Charles Platt Rogers was an early American industrialist, New York City socialite and charter member and director of the Fourteenth Street Bank of New York. His longest lasting achievement was the founding the eponymous company Charles P Rogers & Co. established in 1855. This is longest continuously operating bedding manufacturing and retail company in the United States. The company continues operations to this day and provided more beds and bedding to the finest hotels and clubs than any other company during its first hundred years. Charles was a pioneer in both the manufacturing processes and importation of brass and iron bedstead and a beloved member of the business community of New York; after his death he was referred to as the "dean of the bedding manufacturers of New York City…" in The Furniture Manufacturer and Artisan Periodical, volume 15, 1918. Charles Rogers began his entry in the bed manufacturing business contracting cots for Public School 135 in the Borough of Manhattan in 1854, with another bedding maker named Bradford Willard, a loose association which continued until the late 1850s. Due to bed bugs and vermin during this period in the city, iron and brass beds became fashionable both for style and as they harbored no hiding places for the pests as most wood furniture did. Rogers looked to capitalize on this growing demand. His first retail location in New York City was at 384 Hudson Ave. in lower Manhattan. He was selling mattresses, cots, iron bed frames and wholesaling other materials while developing contacts and suppliers for his brass bed business which he began in earnest in early 1855. He began selling brass beds after becoming the sole importer of Fisher Brown & Co. of Birmingham, England one of the major European producers of sought after, finely crafted brass beds. As his bedding business increased he began selling other items such as down comforters, pillows, bedsprings, divans, iron bedsteads and also began making specialized yacht cushions. Charles Rogers soon became the leading importer as well as manufacturer of high-end brass and iron bedsteads and bedding in New York City. After being highly recommended in the 1870 New York Shopping Guide, he was supplying not only the social elite of the city, but also furnishing the major New York luxury hotels such as The Waldorf-Astoria Hotel, St. Regis, Hotel Manhattan, Holland House, the Herald Square and other fine hotels. The renowned quality and reputation of the company soon led to supplying more distant hotels such as The New Willard in Wash. DC, The Hotel Belvedere in Baltimore and The New St. Charles in New Orleans, LA. Rogers moved the company operations to 264 to 266 6th Ave. and 17th St. in Manhattan to accommodate the increasing demand for his products in both domestic and commercial applications. He was also active in supplying wholesale supplies to other furniture makers in the city including the Herter Brothers. He also opened a second retail location at 89 S. Salina Street in Syracuse. 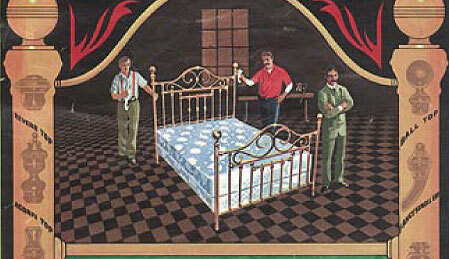 The bed business flourished due to increased availability of home oriented print advertising in publications such as McClure's, Scribner's Magazine, The Century Magazine, Harper's Magazine Making of America Project (1896). Hotel clients now included the New York Biltmore Hotel, The Vanderbilt and The Belmont. Bed makers. Yesterday, today and tomorrow. More than 150 years after the company was founded, The Charles P Rogers Co. is still a manufacturer of hand crafted beds, mattresses, linens, and related bedding products. n the tradition of its founder, Charles P. Rogers still hand crafts iron, wood, and leather beds. Their beds are sold through decorators, their factory showrooms in Manhattan and factory store in East Rutherford, New Jersey and on their website, charlesprogers.com. Rogers's beds have also been used in popular culture appearing in movies such as Devil's Advocate in 1997 and 88 Minutes in 2007 both starring Al Pacino. Television placements include America's Next Top Model in 2003, Extreme Home Makeover on ABC and Catalog This on the Fine Living Network. Charles Platt Rogers was renowned in his lifetime as a master businessman and innovator. His historic and enduring company still resonates today as a cultural touch point, recently author Emily Giffin mentioned the Company as the source for the "four-poster marital bed" in the 2004 The New York Times Bestseller "Something Borrowed".